Tsunan Sky Lantern (津南スカイランタン) is one of the most beautiful light events happens at Ski resort New Greenpia Tsunan, Tsunan Town, Niigata Prefecture. In the middle of March at New Greenpia Tsunan, 2000 sky lanterns will raise to the night sky. No word can explain this breathtaking view. You can feel the universe. This event is the grand finale of Tsunan Snow Festival. You can join and raise your own lantern with your message to the sky. Date: In the middle of March. There are many parking that has shuttle buses to the Event location. The shuttle will be running from the morning to the last events (500 yen). 1. use JR Joetsu Line to Echigo-Kawaguchi Station. 2. use JR Iiyama Line to Tsunan Station. 3. use a special shuttle bus to the event location. 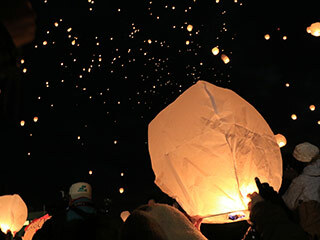 Tsunan Sky Lantern is the finale event of Tsunan Snow Festival. There are 2000 sky lanterns will raise up to the ski of the snow night. It is so mysterious that the sky lanterns rise and spread to the space. This phenomenal event is held in the middle of March at New Greenpia Tsunan, Niigata Prefecture. You can sign up and join this sky lantern event. 1000 Sky Lanterns rise at 17:30 and 20:00 each time. This event is the part of Tsunan Snow Festival. Therefore, there are many food stands that serve the local hot food while you are waiting for this event. There are many activities that you can play with snow so that you won't have any problem for a waiting this event. The event will start from 11:00.